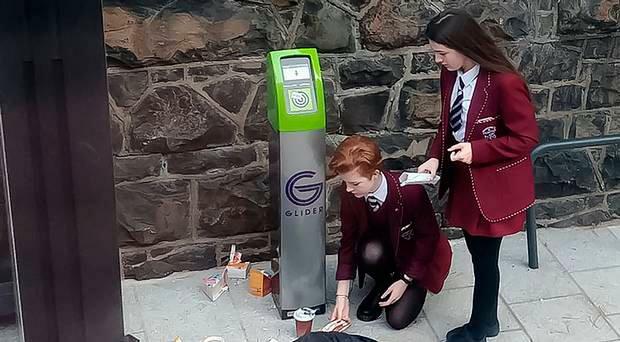 Two schoolgirls whose kindness towards a homeless man in Belfast was snapped by a passer-by have played down their actions. St Dominic's pupils Aoife Morgan and Broghan Kelly, both 14, were moved by the sight of the man sleeping rough outside the school gates on the Falls Road on Thursday morning. "I wanted to buy him a hot drink and something to eat so I bought him a cup of tea," Aoife said. The year 11 pupil was accompanied by classmate Broghan, who wanted to buy him some hot food. "I brought him a warm sausage roll, but he was sleeping so we just set it beside him," she said. The deed was caught on camera by John O'Neill, who was travelling on a passing bus. "It made my day. I thought it was a lovely gesture so I shared it on Facebook," he explained. It attracted an overwhelming response and the school has since been inundated with praise. Vice-principal Phyllis McNulty said she was "delighted but not surprised" by the actions of the two girls. "Our job is to provide quality education, but if our children don't learn compassion and kindness then we have failed," she said. "It means so much more than a string of As in exam results." Ms McNulty also said the girls' behaviour proves that young people have a stronger sense of social justice than they are given credit for. "If they were given opportunities to lead then the world would be a better place," she added. Both teenagers said they don't deserve recognition. "It was the decent human thing to do," Broghan said. "I'd like to think anyone would have done the same." However, friend Aoife said she hoped it might inspire others to be "a bit more generous" towards those who are down on their luck.